Many scholars have speculated as to the origins and age of each concerto: there is a case for dating the sixth concerto to the earliest stage of the composition since it seems to be a ‘group concerto’ employing supposedly archaic instruments, the two violas da gamba. Nevertheless Bach may purposely have been mixing ‘ancient’ and ‘modern’ elements to create a work that was as unique in its form as in its musical ideas. The parts for viola da gamba may have been designed with Bach’s employer, Prince Leopold I of Anhalt-Köthen, in mind; he was, after all, an enthusiastic amateur of the instrument and the parts are relatively simple. This would also suggest a more recent composition. The opening movement employs the ritornello form of the modern Vivaldi concerto and it contains several textural contrasts to give the illusion of solo-tutti forces. The ritornello technique here is one of Bach’s most ingenious: virtually everything counts as ritornello since so much is reused during the course of the movement. Another interesting device is the canonic writing for violas at the outset, by which the two chase one another directly at a very close distance, something which provides an extremely dramatic atmosphere that infects the entire movement. 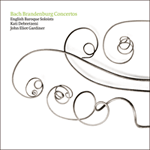 As is so often the case in these concertos, Bach employs the most ‘learned’ of compositional devices to tremendous aural and dramatic effect – perhaps it is this combination of skill and insight that places him so extraordinarily high in the western tradition. The second movement is essentially a sonata trio, another example of the close relation between concerto and sonata genres, by which the concerto becomes more intimate without losing its ‘public’ perspective. The intensity of the melody with its downward leap of a seventh also immediately evokes the human voice. While the da capo form of the final movement originated in the aria genre and the gigue-like idiom came from dance, the elaborated repetitions of the opening phrases recall some of the oldest instrumental idioms, in which players traditionally improvised embellishments over a given melody. 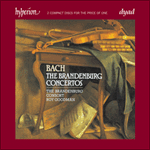 But here again Bach mixes the conventions: the violas da gamba, traditionally associated with the performance of divisions, have comparatively simple parts, while the most virtuosic writing is assigned to those most shy – and derided – of stringed instruments, the violas.